Is feeding rabbits complicated? What should a rabbit eat? What should a herd of rabbits eat? What is considered a well rounded rabbit diet? Are commercial rabbit pellets the best feed for a rabbit? How can folks feed their rabbits, as cost effectively as possible? Can rabbit owners grow at least some of their own feed? These questions are common for both new and experienced rabbit owners, and they are certainly valid concerns for anyone managing rabbits. Yet the answers are not obvious, or simple. Most recommendations for feeding rabbits start off the same: use one of the commercially available pelleted rations. There is a certain amount of wisdom with this approach. First of all, new rabbit owners have a lot of stuff to learn, and they may not always recognize the first symptoms of illness or nutritional deficiency. They may also not have a well-researched feed regimen to work with, or access to the individual ingredients for such a ration. Feeding rabbits a complete rabbit pellet, at least to start with, eliminates a lot of these issues. Most rabbit pellets sold commercially today are nutritionally complete, with correctly balanced protein, carbohydrates, vitamins, minerals, etc. Another advantage is the convenience issue. When feeding dozens or even hundreds of rabbits, it's very easy to establish an average measured ration for each rabbit, and quickly distribute that measured amount into each rabbit's feeder. When a rabbit operation is paying help by the hour, that efficiency can make the difference between the operation being profitable versus losing money. Finally, pelleted rations store very, very well. A large rabbit operation might go through several pounds, or even many pounds of feed per day. Trying to store all that as perishable produce, or even dried hay, can be bulky and expensive, particularly if refrigerated storage is needed. Yet ultra-low-moisture pellets, packed in 50lb bags, can be stored right on a pallet until needed, for weeks or even months at a time without loss of nutritional value. With all these advantages, why on earth would anyone feed their rabbits anything else? There are some drawbacks to feeding rabbits a commercial pelleted ration. As mentioned above, pellets are ulta-low-moisture, typically 10% or less. That can make them hard to digest, particularly if there are any issues with water being available. While owners are encouraged to provide free choice water at all times, that can become a problem during cold weather. If rabbits don't have sufficient water, they'll stop eating the pellets, which can result in a variety of health issues. Secondly, and perhaps most importantly, the pellets are nutritionally complete but they are structurally very different from a rabbit's normal foods. Because of how the pellets are manufactured, each ingredient in the pellet is broken down into very small pieces, then compressed into the pellet form. That means that each particle within that pellet is tiny, like a grain of sand. Yet a rabbit's digestive tract requires much larger pieces of fiber in order to function correctly. The speed at which foods move through the rabbit's digestive tract is directly related to how much large pieces of fiber are present in the diet. The smaller the particles, the slower the digestion becomes. Impaction can result, either from undigested feed, and/or hair from the rabbit's own grooming. And impaction can kill a rabbit dead with very little warning. Another issue is that the pellets are so nutritionally complete, that it's very easy for a rabbit to gain too much weight on a diet of pellets alone. It's akin to a human being eating a super-rich diet for breakfast, lunch and dinner, every single day. A rabbit's nutritional needs change during its lifetime, with a great deal of fluctuation. A young rabbit needs a diet with a lot of nutrients and protein to support a healthy growth rate. Pregnant does need a similarly rich diet to support the growth of large litters. And lactating does need the highest grade of nutrition of all, to maintain their own needs while feeding their kits. Since most commercial rabbit farms have a large proportion of their stock either in the growth, pregnant or lactating phases, it is a safe management strategy to feed the entire herd a commercial ration. However, for pet bunny owners, or for small-scale rabbit owners who don't push their rabbits to such high levels of production, their rabbits can gain too much weight on the same diet. That creates its own issues, including infertility, heart disease, joint issues, etc. Finally, a commercial pellet ration purchased by the bag at a feed store, is possibly the single most expensive way to feed a rabbit ever invented. That type of feeding has so many middlemen layers between the source and the final consumer, that rabbit owners have very little maneuvering room for saving money using this feed. The first step for feeding rabbits a new ration, is to measure out how much pelleted feed any given rabbit receives. When the rabbits are growing, they can eat unlimited amounts of pellets as long as they have constant access to fresh water. But as their growth rate slows, they should be taken off unlimited quantities of pellets, and instead be fed measured amounts. The general consensus is currently 1/8 cup of pelleted feed per 4lbs of body weight. The pellets themselves should be at least 22% crude fiber, no more than approximately 14% protein (if pellets are the only source of feed, but see below), about 1% fat and about 1.0% calcium. Those values will be printed right on the label. Some rabbit feeds have very different rated rates of nutrition, with protein going as high as 18%. So read the label to be sure. Once you know how much your rabbits are eating, and you have them on a maintenance-level diet, then you can consider some alternatives. Rabbits can do very well on feeds which don't include any pellets at all. But most folks have relied on pellets for so long, they get nervous about feeding rabbits if pellets are out of the picture. Where to start? One very good option is to learn about several well-respected, well-researched rations which are already in use, and determine how well that ration could be folded into any given owner's particular circumstances. Most alternative rabbit rations use grass hay as a basis, then supply additional feeds in addition to the hay. Those feeds may include fresh grazing or browsing, leafy greens and vegetables. Food items such as fruits, seeds, nuts, and/or grains, should be considered treats and fed sparingly. Many folks would like to improve their rabbits' diets, but are concerned about moving away from pellets entirely. Never fear, feeding rabbits a balanced ration can draw from both approaches. One good option is to simply supplement the pelleted feed with hay. This single addition will prevent many of the health issues which come from using pelleted feeds alone, without adding a huge amount of additional work. The hay should be a grass or grass mix, such as timothy, orchardgrass, bahia, etc. Whatever is produced locally will work as long as it has been cut, baled and cured under good haymaking conditions (ie, hot and dry). No mold, no damp, no mud or dirt, and avoid weedy hay if possible. If you're not sure what's available in your area, check with local livestock groups and they'll be able to point you in the right direction. Be aware that feed stores are often the more reliable source of hay at any given time of year, but they're also the most expensive. If you can find local hay growers and work directly with them, you can often get hay at 1/2 the cost of retail (or better). Avoid clovers, alfalfa, pea vines and bean vines as a source of hay. Those can all be high quality feeds, but they are too rich for rabbits. When feeding supplemental hay, be sure to cut back on the quantity of pellets, but also consider boosting the pellet protein a bit if the rabbits are still growing, pregnant, or lactating. 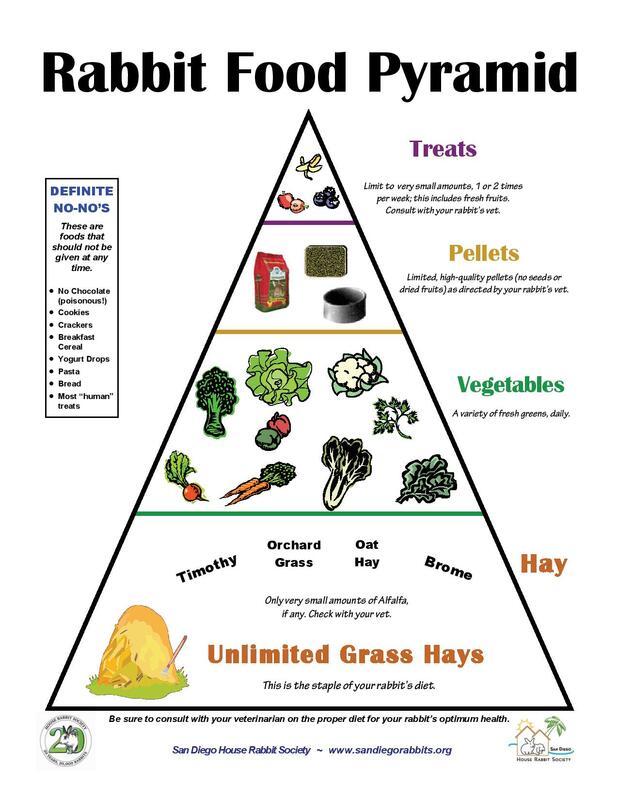 Grass hay generally has protein levels in the 8%-12% range, and rabbits need protein in the 14%-16% range. So consuming hay alongside 14% rabbit pellets, would reduce their overall protein intake below what it should be. Buying a higher protein pellet, say 16% or 18%, plus hay, brings the overall protein back into the 14%-16% range. A second option is to alternate pelleted feed with a home-mixed ration, every other day. For instance, owners could feed a commercial diet on Mondays, Wednesdays and Fridays, with the alternate ration on the other four days of the week. Or vice versa. This would ensure that the rabbits get the full benefit of both types of feed. A second option is to feed both types, each day,with reduced quantities of each. So the above ration could be cut in half, and supplemented with a very small portion of pelleted feed. A third option is to grow a small garden or garden bed, specifically for the rabbits, then turn out the rabbits each day for some grazing time. Rabbits are famous garden thieves, precisely because many of the garden plants we grow are also on their preferred menu. This approach would have the benefit of offering rabbits not only home-grown feed but the exercise and mental stimulation which comes from harvesting it themselves. The downside is that the rabbit owner would have additional gardening duties to create a healthy mix of garden plants, and additional fencing duties to ensure the rabbits only have access to those areas intended for them. Before going this route, owners should review which fruits/vegetables are safe for rabbits, are only suitable in limited amounts, or are positively not a good idea. A number of those lists are available online; one of them is a list provided on MyBunny.org. The good news is, there is no one correct way to feed rabbits. Many good alternatives exist, each one with its strengths and weaknesses. We encourage owners to do their homework, try alternatives on a limited basis to see what works and what doesn't, then craft a well-rounded diet that works well for their animals AND for them. Towards that end, here are some additional resources that rabbit owners can look through to learn about rabbit nutrition, diet options and ration quantities/amounts. We're quite sure your rabbits will be pleased you spent the time to do this homework on their behalf. ATTRA has a wonderful, free, downloadable PDF about small scale commercial rabbit production, which includes information on cost-effective commercial rabbit feeding. The University of Miami has a nice page devoted to rabbit nutrition, and some do's and don'ts for rabbit feeding. The University of California-Davis has a nice downloadable PDF on the basics of rabbit care and feeding. This rabbit nutrition guide from the Philippines provides some very detailed information on how much of each major nutrient is needed at each stage of rabbit production, and how to provide those nutrients either with purchased or home-grown feeds. Measurements are in metric units. While many people reading this website are interested in rabbits as livestock rather than pets, these next websites offer a lot of solid information on what works and what doesn't. The House Rabbit Society is one of the largest, if not the largest, pet rabbit authorities. Their website is extensive, with 23 different pages on diet alone. I have often referenced their pages whenever I write up rabbit information, but particularly in the realm of diets. Their pages regarding Suggested vegetables and fruits for a well balanced rabbit diet, General Diet Guidelines and Rabbit Food Pyramid﻿ are particularly helpful. Zooh Corner Rabbit Rescue is another pet rabbit information website, with a lot of good suggestions on providing a well balanced diet. Their Rabbit Nutrition and Diet page is a very good source of dietary information.